but I am madness and madness is me it holds you captive like a hapless bunny caught in the headlights. In this moving collection of poems, award-winning writer Sandy Jeffs shares her journey through madness over four decades, drawing inspiration from Lewis Carroll's Alice in Wonderland and the motley gathering of characters at the Mad Hatter's tea party. 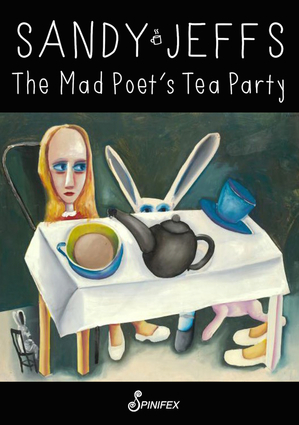 Both delightful and insightful, playful and serious, witty and whimsical, The Mad Poet's Tea Party provides a devastating commentary on how our society treats those with mental illness from the perspective of someone who has experienced all its interventions. It captures in poetic form the enigmas and contradiction in madness. Sandy Jeffs is a Melbourne poet who has published seven volumes of poetry and a memoir. Her first book Poems from the Madhouse was awarded second place in the FAW Anne Elder poetry prize 1994. Her memoir Flying with Paper Wings: Reflections on Living with Madness was shortlisted for the 2010 Age Book of the Year, named SANE Book of the Year 2010 and was commended in the 2010 Human Rights Awards. She has lived with schizophrenia and all its moods since 1976. Sandy has been a public loony for many years presenting as a human face for this often misunderstood condition. She lives with her friends and animals in a place where it's Christmas every day.